Hey Dullblog, the Beatles fan blog » Just how blind was John Lennon without his glasses? Just how blind was John Lennon without his glasses? 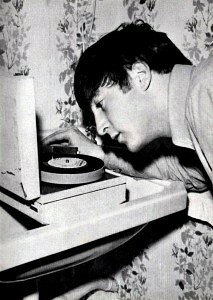 Lennon peers down uncertainly at a 45. A slight disability like that (perhaps the disability is being too vain to wear your specs!) often pushes people into their imagination. From there, it’s a short step to full-blown creative pursuits. And bad vision isn’t all bad; I still remember the day I was walking down the street and saw a beautiful little bird leaning against the gutter, almost as if he were sitting in a chair watching the titanic cars whiz by. Then I looked again, and it was a wadded-up napkin. Anybody have any favorite Blind John stories, put ’em in the comments. @Devin–that story is too funny! I like Paul’s story of John and Cynthia arguing about which one of them would have to wear their specs into the restaurant. Where’s that, Stew? I’d love to read it/copy it into the comments. I think it’s in the Anthology film. Actually, it’s from the Anthology book. Reminds me of James Thurber’s essay “The Admiral At The Wheel” where he thinks he sees various whimsical things, but it’s really his failing vision. All Buddy Holly fanatics know that Lennon was blind as a bat until he was inspired by Buddy’s specs to put on a pair of glasses…. and for the first time he actually saw his appreciative audience. Paul has told this anecdote many times, usually at Buddy Holly conventions. There is a story that George tells, but for the life of me I can’t remember where I heard it — probably on YouTube somewhere. George quips that John was blind as a bat, but never wore his glasses. So he would walk into a club or restaurant behind George or Paul, letting them lead the way. Many a time, however, they led him into a bathroom or broom closet. Nice lads! P.S. This is my first time posting here. Hello everyone. I don`t know for sure when this happened, but Lennon started wearing contacts at some point during their touring years. Of course, when they quit touring he wore his granny glasses. According to Goldman, Lennon had an assignation with a woman in Hong Kong who showed him how contact lenses worked. (“Great night! Great night!” he quotes Lennon as saying; it’s one of the few positive moments in the book.) I assume that was during their 1964 visit.